I can't believe we're coming to the end of August. Soon, schools will reopen, traffic will build up and the weather will begin to get cooler. I can't say I'm not relieved. It was a hard summer of trying to entertain a spritely three year old indoors and fending off questions about why we won't be going to the beach in the near foreseeable future. I am so ready for the new school year to start. For Maryam, it will be a new school, a new environment, new friends and lots of new adventures. I am so excited for her and so is she. We are both looking forward to this new journey and settling into a routine. Routine. Something I thrive on. Something that has been missing on this blog of late. My intention was always to blog once a week but it seems I have been apologetic on numerous occasions for not being able to as often as I'd like. I do think about it often though and have a whole notepad full of ideas and recipes begging to be tried. But today I bring you something that I've been making for the past five years. That's right- five. I'm surprised I haven't blogged about it before. 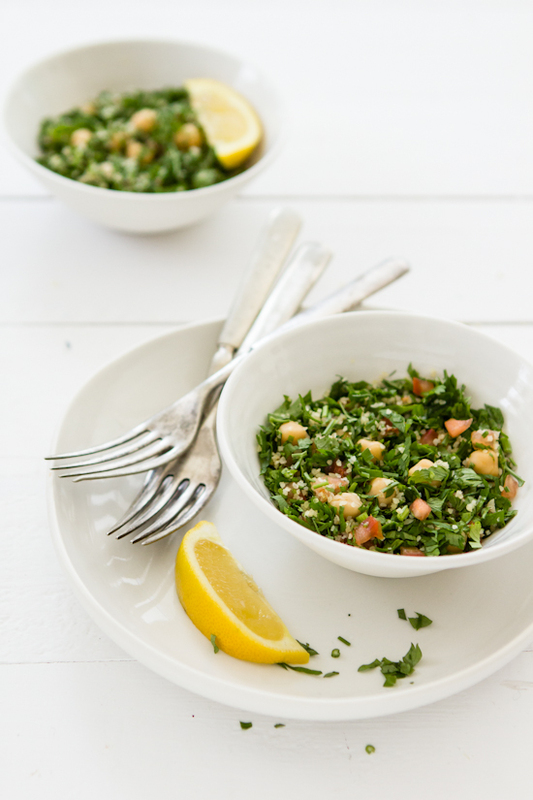 This tabbouleh was one of the very first Middle Eastern dishes I learnt to imitate when I first moved to Dubai. The abundance of parsley and torn specks of mint not only make it vibrant but the perfect palate cleanser when paired with meats and poultry. Recently I have been eating it on its own as lunch and to make it a bit more hearty and satisfying, I added chickpeas (you can omit this if you wish to be more authentic). On a separate note, I have finally joined Pinterest, although sometimes I almost wish I hadn't! So many beautiful things like this ceramic cake stand. And wouldn't you want to live in this house? Oh and I'll definitely be making this cake soon. To make the dressing, add all the ingredients to a jar and shake vigorously. Set aside until ready to serve. Add the lemon juice to the burghul and let it sit for ten minutes. Use a fork to separate the burghul. In a bowl, put in all the salad ingredients including the burghul. Drizzle the dressing and serve immediately. 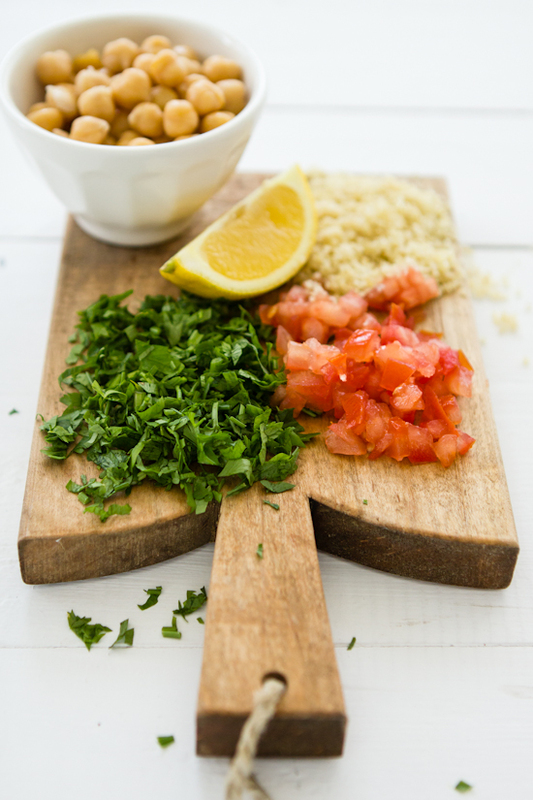 Note: Make sure the parsley is completely dry before chopping (do not use the stalks). Chop with a knife and do not use a food processor as this will bruise the herb. Healthy, fresh and tasty! A wonderful salad. This looks absolutely beautiful - so light and fresh and perfect for summer. 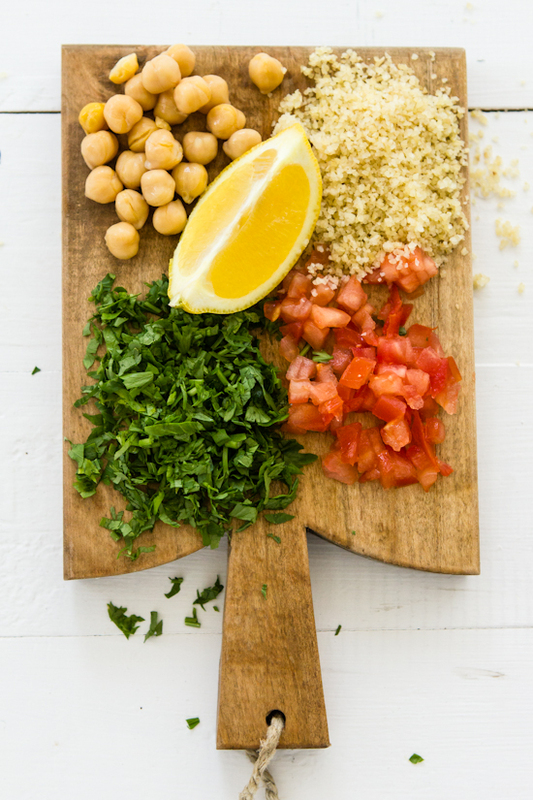 I made a huge batch of chickpeas the other day and was planning on hummus but might have to make this as well! This looks gorgeous! 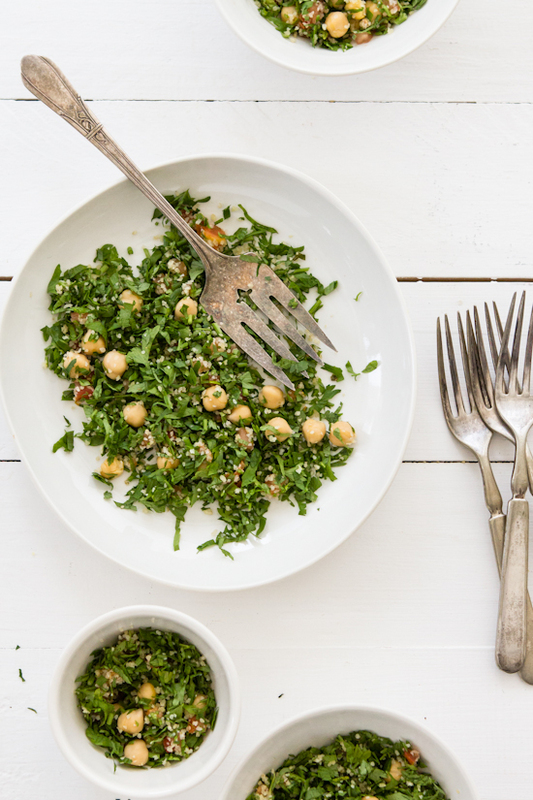 And the perfect way to add protein to tabbouleh (since I often make a big batch to save the leftovers for lunches, but it's not quite as filling as it could be... problem solved!). 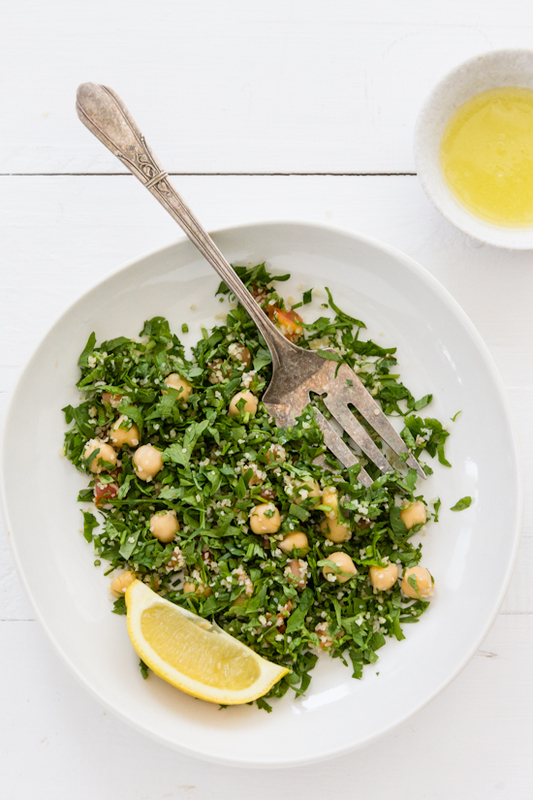 I love the fresh flavors of the mint and parsley, it's the perfect summer salad. Gorgeous salad! 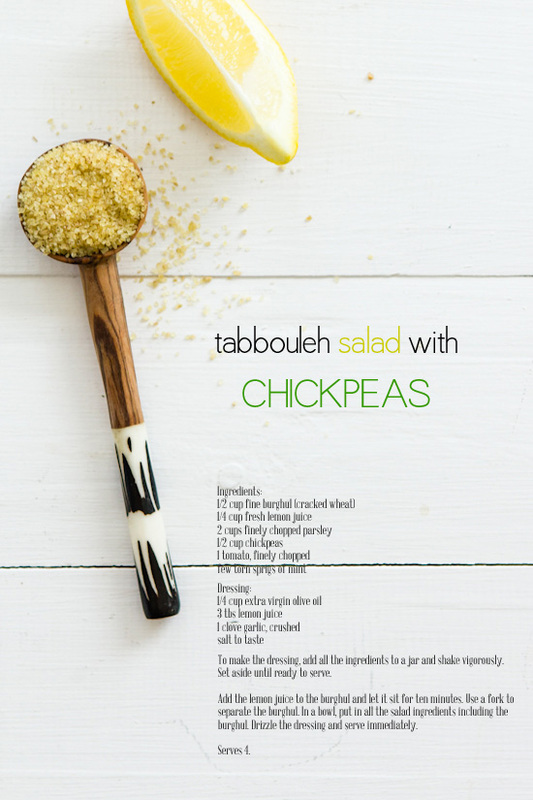 I absolutely adore tabbouleh, but have never had it with chickpeas. I will have to try it as it makes it a bit more of a meal. This is such a great simple dish and so full of health. Delightful! I could have salad like this every day! ps. and since i did not have wheat, i added 3 color quinoa instead, and some white cheese (sort of like not salty feta) and some walnuts to make it crunchy and more filling too. 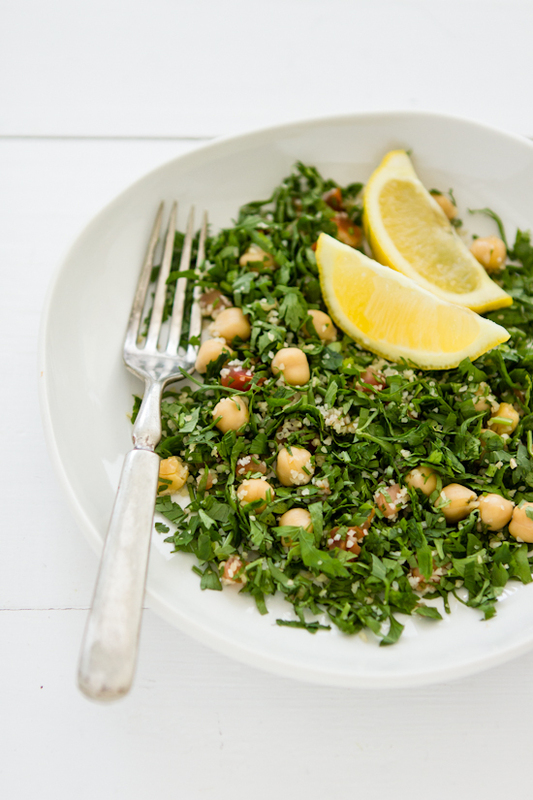 Love tabbouleh salad -- filled with herby goodness! surely this is quite healthy. I have been making this for lunch very frequently too......it's a snap to make and not much cleaning needed and with chickpeas added it makes it very filling too. I am not much of a purist, so I add diced cucumbers and red/yellow/orange peppers to it too. The photography and styling on your blog is droolworthy! Great lunch and your photo's are just gorgeous! I thought that I had commented on this one already... am catching up on all the posts that I've missed out during the summer break.